Practicing different rhythms to a metronome is probably the most important (and honestly, the least fun) part of my practice schedule. But just playing along to recording, even if it's a simple string of eighth notes isn't the same as practicing along to that click. By playing to a metronome instead of a recording, you strip away all the other noise and you're left with nothing but the rhythm and your playing. There's no big drums or rhythm guitars to hide when your notes are a little off, or the attack of your plucking or picking is sloppy. You've got nothing else to listen to except your bass. 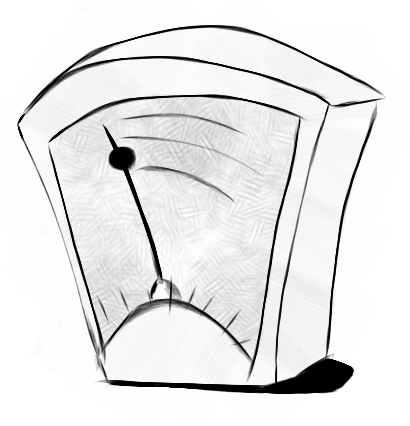 The other thing that's great about playing with a metronome is how slow you can go. Playing along to a rock song at 110 beats per minute is great, but that speed can hide sloppiness. Crank your metronome down 60 beats per minute and see how your tone is. Are you clearly fretting each note? Are you holding it long enough, and releasing clearly when you're done? How is your right hand doing? Are you alternating your plucking fingers properly? If you slow down and really nail your tone slow, when you speed it up you'll be playing cleaner and sounding better. I know the temptation is to jump straight from warm-up exercises to playing songs (especially after a long day at work, when bass playing is serving as my wind-down and relaxation time), but in the long run, spending the time and playing it slow will make you a better bass player.